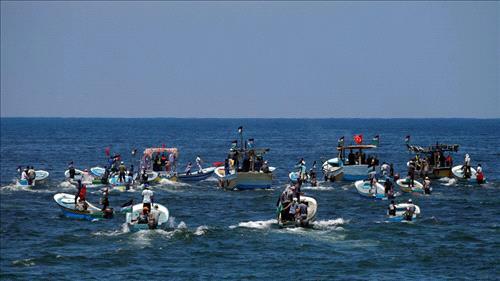 AMMONNEWS - Israel’s navy seized a boat on Tuesday that had left from a Gaza port with wounded Palestinians aboard in a bid to challenge the blockade of the Hamas-run enclave. The passengers “with specific needs are prevented from travelling, receiving care and finishing their studies,” said organiser Raed Abu Dair. But the boat was seized by Israel’s navy a short time after setting off. “After the boat and the Palestinians on board are searched, the boat will be towed to the Israeli navy base in Ashdod,” Israel’s military said in a statement. A similar attempt was made in May and also resulted in Israeli forces seizing the main protest boat several kilometers (miles) out to sea. Israel’s blockade restricts Gazan boats to up to six nautical miles off the enclave. A spokesman for Israel’s fire service says 750 fires have burned 2,600 hectares, putting the damage at millions of shekels (hundreds of thousands of dollars/euros). Since protests and clashes broke out along the Gaza border on March 30, at least 139 Palestinians have been killed by Israeli fire and more than 4,000 have been wounded by gunfire.